After discovering a lost tea dragon in the marketplace, Greta learns about the dying art form of tea dragon care-taking from the kind tea shop owners, Hesekiel and Erik. As she befriends them and their shy ward, Minette, Greta sees how the craft enriches their lives--and eventually her own. A charming, quiet fantasy about a young girl, Greta, who is torn between apprenticing with her blacksmith mother, or learning the fine art of raising tea dragons, whose leaves can be harvested to make tea. There is not a lot going on in this slim colume, and that's perfectly fine. This is a refreshingly original and kind story, and the illustrations are simplistic, yet beautifully whimsical. Katie O'Neill has been publishing this story online at The Tea Dragon Society, and I'm delighted that it is finally available in print. I'll definitely be picking up later volumes. 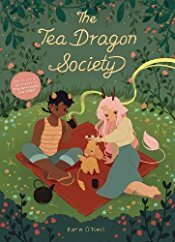 The Tea Dragon Society by Katie O'Neill will be released from Oni Press on October 31, 2017. I received an eARC copy of this book from the publisher thru NetGalley for a fair and honest review.